Today's web is pretty much built on WordPress, however, many themes are expensive, and likely to malfunction. 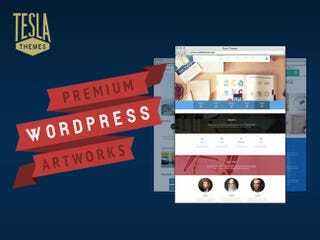 To help solve this problem, we've teamed up with TeslaThemes (nothing to do with Elon Musk) to bring you a bundle of 20 clean, fully-responsive WordPress themes for $29 — that's 55% off. The collection covers blogs, portfolios, business sites and more, and all of these designs are based on Tesla's framework, meaning code-free customization. Also included is a whole year of support, full HTML documentation and the PSD of each design. Oh, and you can use these themes on as many domains as you like. Not bad, eh? To get this deal, see the full collection, play with the live demos and read all the extra info, head for the link below.